This recipe is a homage to the macaroni cheese created recently by Helen Graves for Fiona Beckett's bloggers Mac & Cheese competition here and is, to my mind, the most genius adaptation of a recipe familiar to most of us. You can find Helen's recipe and the story behind it here. I love macaroni, the slightly denser hollow pasta tubes with it's satisfying bite but am yet to find a gluten free version in the UK. In fact, on the day I went to buy pasta for this, I could only find corn & rice fusilli which is certainly not a combination I would choose naturally. But since it was the only pasta on the shelf, it is now the pasta which is enveloped in the most cheesy sauce awaiting baking for tonight's supper (and probably tomorrow night's too). The genius behind Helen's mac & cheese is that she cooked her pasta in a ham stock, this was the bit that really grabbed me. So yesterday morning I found myself in a queue ten deep at our local butcher crossing my fingers that no-one else in front of me had read Helen's blog and was also queueing for one of the 3 remaining ham hocks on the platter in the window. I watched a couple of young women in front of me buy the best part of half a pig cut to their requirements: joints, chops, boned belly, mince all packed into big clear plastic sacks and pay the most ludicrously low price for the lot ... all freerange and locally farmed, and all such amazing value. It was also great to watch that their order didn't phase the butchers or annoy anyone else in the queue, in fact it didn't actually seem to slow up the queue very much at all, two butchers diverted to process their order and the other 3 carried on serving the rest of us. I spotted a pack of oxtail which I couldn't leave without buying, along with some lamb steaks for the teen who made marinated shish kebabs, tabbouleh with quinoa, hummous and pitta for supper for us all last night (it was lovely!). The ham hocked simmered during the afternoon as we cleaned up around the on-going building works. I left it to cool in the stock over night and today converted it into the most unctuous pasta & cheese bake. The pasta was cooked in the stock for 2/3 of the packet cooking time before draining into a second pan. As I was leaving the pasta al dente (gluten free pasta gets soggy so quickly), it seemed sensible to try to squeeze even more of that flavoursome stock into the dish. So veering away from Helen's recipe I made the cheese sauce with half soya milk and half stock (using the pasta cooking stock). I was trying to capture as much of the flavour of the stock as possible whilst at the same time reducing the dairy content - quite difficult when the recipe calls for 500g cheese! I used a mixture of cheeses, very much what we had in the fridge at the time, which was Sussex High Weald's Ashdown Forrester, Bookham's Sussex Charmer, the tail end of a Wensleydale and also a hunk of artisan Red Leicester. This has made a very rich quite complex flavour though lacking a little bite which 100g of really good cheddar would have added. Next time I will use the same combination but with the cheddar, 100g of each. So here we are, I know it taste's great (chef's perks!) even though it hasn't yet been baked in the oven. There is enough pasta and cheese to feed a small army ... or our family for today, and possibly tomorrow! Cover all of these with water in a large pan, bring to a boil. Once boiling turn heat down to a simmer, cover with a lid and leave to cook for 2-3 hours. When meat is tender and flakey, turn heat off and leave the hock to cool in the stock. Once cold, drain the stock and pick the meat off the ham hock. Chop the meat finely and chill until needed. Bring the stock to a rolling boil (don't salt). Add the pasta and cook for just over half the time stated on the pack. Drain the pasta into a sieve placed over a second pan. In a heavy bottomed saucepan, make the bechamel by melting the butter, then adding the flour. Stir or whisk the two together over a gently heat and keep stirring for 3-4 minutes allowing the flour to cook through. The flour will come together into a thick mass which will then break down again as you continue to cook. Take the pan off the heat, pour in the soya milk whilst whisking constantly and keep whisking whilst the sauce thickens. Add the hot stock and simmer the sauce gently for a few minutes. Remove from the heat and stir in the cheeses, stir gently until fully melted. Sprinkle over the ham reserved from the hock. Taste and season with nutmeg, pepper and / or mustard to taste. Assemble the mac by adding the pasta to the cheese sauce and mixing together. Pour into a large baking dish. Bake at 200°C until hot throughout and browned on the tip. Before baking, if you want to, you can top this as per Helen's suggestion with more cheese mixed with breadcrumbs. However by this stage I was beginning to worry that we might all die of heart attacks whilst eating this (!) so I omitted this crunchy cheesy topping and opted instead to serve with a crunchy chicory & little gem lettuce salad with a mustardy vinaigrette. Gosh that is devotion to duty! Bet it tastes divine. Oh you wicked girl! I am supposed to be dieting.... now look what you have done! 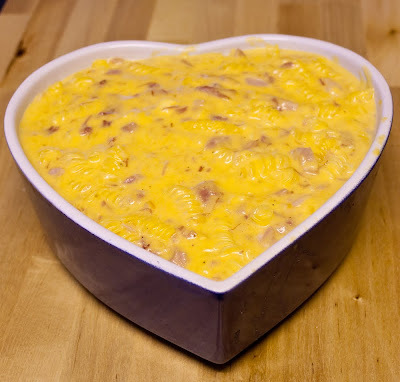 Mmm, I love macaroni cheese. Also, I love your heart-shaped dish! Janice, I do love ham hocks (and so cheap too!) so not entirely devotion but possibly a little OTT for a sunday night supper! Wendy, I quite agree. I am supposed to be on a no-fat vegan diet & am seeing a specialist tomorrow... I will no doubt be the most unpopular patient! Though it is a sign of how much this recipe grabbed me that I threw caution to the wind to try it out! Literarygeek, the dish came from a trolley stuck outside a small supermarket in Normandy, the sign read "pate dishes, 1 euro each, pay inside" ... so I did! Oooh I have never heard of using ham stock, yum! Love the dish you used too! Having checked it a little more not sure why i don't know the company as it's run by someone who has been in the industry a long time but I'm good at blanking company names !